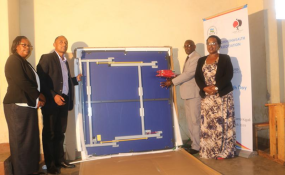 Rwanda Table Tennis Federation president Jean Bosco Birungi (second from left) hands over a brand new table tennis table to the administration of G.S Camp Kigali in Nyarugenge District. The local table tennis governing body (RTTF) has continued its prime goal to expand the sport across all corners in the country. While celebrating the Commonwealth Day 2019 on Monday, under the theme "A Connected Commonwealth", RTTF introduced the game to G.S Camp Kigali primary and secondary schools. The sport is one of the disciplines that are recognized and supported by Rwanda Commonwealth Games Association and the Olympics. "This is the first time to partner with Rwanda Commonwealth Games Association, it is an opportunity to expand and promote table tennis in schools across the country, said Jean Bosco Birungi, the RTTF president. He added, "Camp Kigali are our first school partner, and the move to secure partnerships with schools continues." The federation donated equipment to the Nyarugenge-based school including a brand new table tennis table, balls and paddles (bats) so students can learn and practice the game. According to Birungi, RTTF has long-term strategic plan not only to nurture young talents in schools, but also to train empires, coaches and increasing the number of clubs this year. Mohamed Ufitinema, the school head boy, told Times Sport in a separate interview that his school lacked equipment to play the sport, and thanked the table tennis body for the donation and initiative to partner with Camp Kigali. While addressing the gathering, UK High Commissioner to Rwanda Jo Lamos reminded the students that Commonwealth has 2.4 billion citizens from 53 countries, noting that 60 per cent are youth under the age of 30 years. On behalf of the National Olympic Committee, Felicite Rwemalika, who is also a member of the International Olympic Committee executives, emphasized that sport creates and fosters friendship and mutual respect through teamwork and fair play. Around 600 students from G.S Camp Kigali entertained the guests to celebrate the day with a broad range of activities such as debates, essay writing and table tennis competitions.